Comet Jacques made its way into being relatively bright this August. It was not something to see without optical aid however. A telescope or good binoculars were required. I took the Nikon D7000 out with a 200mm lens, attached it to the back of our observatory’s Takahashi refractor and then took a series of images. 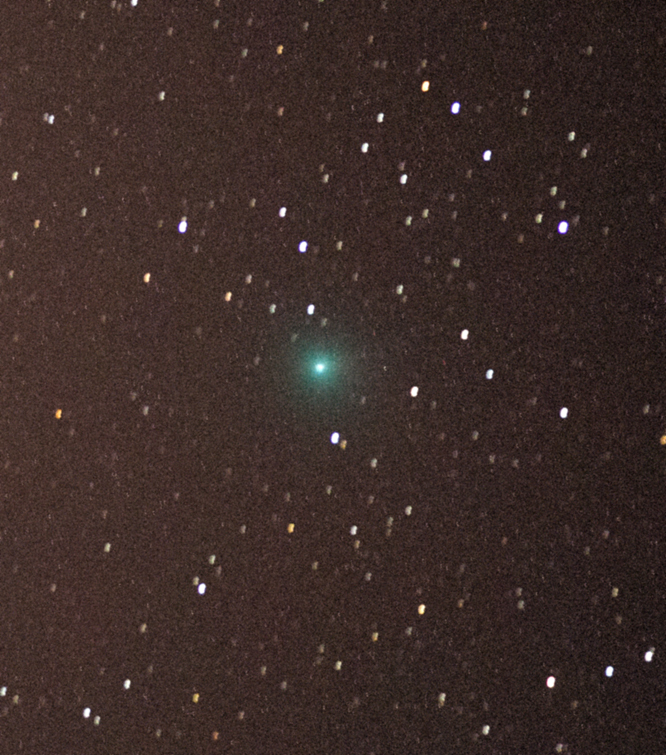 Some work in Photoshop stacking 5 minutes of images rendered this…..
Comet 2014 E2 Jacques: a 5 minute total stack of 30 second images taken through 200mm using Nikon D7000, 25-August-2014. I have been getting up at 4:30am each morning for the last three days to see if we have a good clear sky. Today was that day, and low in the northeast were Jupiter and Venus making a show of their conjunction. I got some pics for you. The first is a view of rising Orion and the waning crescent moon with the morning ground fog. Be sure to click on the images to get into a larger view. Tomorrow offers a fine opportunity to see a brilliant planetary alignment, or conjunction, of Jupiter and Venus. If you go out before sunrise and look east, low to the horizon, you will see Venus and Jupiter very close to each other. It is not a very common event, so it is worth going out to see.